When picking up your daughter from Lynnfield Middle School one afternoon, she tells you her health teacher gave her a project on their newest topic – oral hygiene. Her presentation is called Dental Anatomy 101, and, based on the instructions for the assignment, you’ll need to help her with her research. Luckily for you, Dr. Rob Schumacher, your dentist in Lynnfield, can give you all the facts so your favorite girl can ace her project and keep her smile healthy in the process. What Is The Story Behind My Teeth? Each and every one of your teeth are important. To give you the basics on all 32 of them, take a look at the details below from the experts at Schumacher Dental. Central Incisors – These are the front two teeth on the top and bottom jaw. You bite with these because they’re the sharpest teeth you have. Their job is to cut food and then move it back in the mouth. Lateral Incisors – These are the teeth on either side of your two front teeth. They also help bite and cut food, since your two front teeth need reinforcement for all the primary work they do. Canines – These are the teeth in the corners of your mouth. They have very long roots, since they’re used to grasp and tear food. They usually look pointy and sharp, and have recently become a popular subject in contemporary vampire-related, young adult fiction. Pre-Molars – These are located just behind your canine teeth, on the side of your mouth. You have two sets of premolars that are flatter than your front teeth, since they are there to crush food. 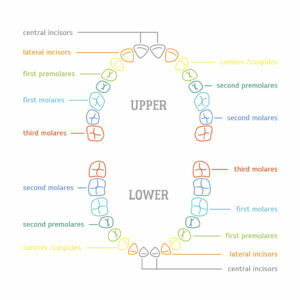 Molars – You have two sets of molars that reside, as expected, right behind your premolars. Molars are bigger and flatter than premolars, since their primary purpose is to grind food into small pieces that are easy to digest. Wisdom Teeth – Third molars, also known as wisdom teeth, are the appendix of your mouth. Part of the history of human development, we needed these when we were cavemen to help chew tough plant roots, raw meat, and uncooked vegetables. Now that our diet is easier to process, they serve no purpose and usually end up causing more problems than they solve. These are extracted in 95% of patients. How Do Teeth Develop Over Time? Teeth are a wonder of the human body – they begin forming when a baby is in utero and continue developing after birth. Children have 20 primary (baby) teeth and 32 adult teeth. We’re born with the “tooth buds” for both sets and the bones develop in our jaw as we age. Baby teeth will start showing up in the mouth around 8 months to 1 year of life, and adult teeth should begin coming in at age 7-8. What Can I Do To Take Care Of My Teeth? 2x2x2 – Brush gently, twice a day, for two minutes and floss when you brush. See your dentist at least twice a year for professional exams and preventive care. Since your teeth are so important, don’t just research and learn about them for school – take care of them, too. Schedule your appointment with Schumacher Dental today!